Ranting Panda: Australia Day - Invasion ruined your life? Get over it, you're ruining our party! Australia Day - Invasion ruined your life? Get over it, you're ruining our party! As the debate around Australia Day continues, so does the entrenched racism of many non-indigenous Australians with claims that Australia wasn't invaded, but peacefully settled by the British. Some claim that it could have been worse had it been the Dutch or the Portuguese or the Spaniards who invaded. Except these type of statements white-wash the genocide, massacres, ethnic cleansing, human rights abuses, eugenics and inhumane treatment that the British unleashed on the indigenous population. The British declared the land 'terra nullius', empty land, and then set about systematically claiming the land for themselves while forcibly displacing the indigenous population whom they felt were less than human, or at best, were inferior to white people. Captain Arthur Philip, the first governor of New South Wales, is often portrayed as a philanthropist who befriended the Eora people. Philip was committed to harmonious relations with the native occupants of the land, however, this didn't last long. Phillip's gamekeeper, John Macintyre was a brutal man who killed dozens of indigenous people. When he got speared by a man named Pemulway, who took exception to Macintyre's brutality, Phillips gave the order to kill six indigenous people in retaliation(1). Contrary to popular opinion amongst some, the 'settlement' or 'colonisation' of Australia was not peaceful. Throughout the 19th century, most white settlements considered themselves to be at war with the indigenous population. One settler remarked, 'But if ye take their country from them, and they refuse to acknowledge your title to it, ye are at war with them; and, having never allowed your right to call them British subjects, they are justified by the usages of war in taking your property wherever they find it, and in killing you whenever they have an opportunity'.(2). These wars, of which there were many, have come to be known as the Frontier Wars. If anything gives credence to the claim that this was an invasion, it is the number of wars and massacres that occurred during this time. Historians have compiled on online map of massacres, with a massacre defined as the killing of more than six people. Between 1788 and 1872 there were approximately 184 massacres, killing an estimated 3,598 aborigines. The Tasmanian Black War annihilated almost the entire indigenous population of the island(3). These massacres do not include the ongoing clashes between settlers and the indigenous population where there were fewer than six people killed. Nor did the massacres end in 1872. As late at 1928, massacres were occurring. That year saw the Coniston Massacre in the Northern Territory, in which at least 60 indigenous men, women and children were murdered by police(4). According to former Prime Minister John Howard, 'there was no genocide against Indigenous Australians'(5). Tell that to Tasmania where almost the entire indigenous population was wiped out. Tell it to the thousands of victims of massacres. Former Prime Minister Tony Abbott, perpetuating the white superiority that Australia was founded on, stated that white settlement was good for aborigines(6). Abbott has a long history of racist comments about indigenous people and demonstrating a complete lack of cultural awareness. In 2014, he perpetuated the concept of terra nullius when he stated that when the First Fleet landed, Sydney was nothing but bush. He went on state that from the First Fleet we now have 'one of the most spectacular cities on our globe'(7). No mention of the exploitation or contribution of indigenous people to Australia's history. Sadly, the colour TVs of modern society came at a high cost. Abbott has ignored the fact that modern Australia was built on the blood, sweat and tears of the First Nations People, who were exploited, raped and murdered at the hands of white settlers. White settlement amounted to ethnic cleansing of the land. Much of the indigenous population was forcibly removed and relocated to areas they often had no links with, without recognition of their tribal boundaries, nor of the intricate marriage structures they had in place with neighbouring tribes. It wasn't like the government didn't know what it was doing. For the centenary celebrations to be held on 26 January 1888, then NSW Premier, Henry Parkes, was asked if aborigines would be included in the festivities. Parkes replied, 'And remind them that we have robbed them?'(8). Some of the white overlords wanted to 'breed out the coloured population'. Over the years, white people began breeding with aborigines. Not all of this was consensual. The white settlers often raped Aboriginal women. It was noted by a number of influential people, such as AO Neville, Western Australia's Chief Protector of Aborigines (an Orwellian misnomer if ever there was one), that black people would eventually be bred out, which he articulated in his 1947 book, Australia's Coloured Minority: It's Place in the Community.(9). It was common belief that pure-blood aborigines were of inferior genetic stock and would eventually die out(10). In what amounted to eugenics, for decades the white overlords controlled who aborigines married, stole their half-caste children and aimed to encourage breeding with white people to 'breed the colour out'. The government claimed that the children were removed because of abuse in their family situations. However, the white idea of abuse was often the perception that pure-blood aborigines were considered to be inferior to white people and incapable of raising mixed blood children. Additionally, the government did not want traditional Aboriginal customs to be taught to children. For that matter, they didn't want aborigines practising their culture at all. One of the aims of forced removal was to teach mixed-blood children the ways of western civilisation(11). Far too many Australians believe that these issues concluded 200 years ago and that indigenous people should just 'get over it'. However, more than two centuries of government policy and social prejudice have formalised institutions that still exploit and abuse indigenous people to this day. They are over-represented in the court systems, often being arrested for crimes white people will never be arrested for. They are over-represented in deaths in custody. They suffer with sub-standard health care and education. Having said that, what is wrong with commemorating the abuses of two centuries ago? Australia remembers historical events on Anzac Day and Remembrance Day. Most countries remember significant wars and battles, so why shouldn't Australia commemorate the Frontier Wars and honour the sacrifice of the First Nations People? No-one would tell Jews to get over the holocaust. Why should Australia's indigenous people 'get over' the genocide. Besides, there's a difference between getting over something and remembrance. Some Jews have moved from the holocaust, some haven't; but either way they still remember and commemorate it. Some Australians have not yet gotten over the cruelty of the Japanese in World War II. This was evidenced during the 2003 Rugby World Cup, when Townsville embraced the games played by Japan. Some locals were horrified that other locals were carrying Japanese flags and wearing Japanese jerseys. Either way, the city remembered and commemorated the anniversary of Battle of the Coral Sea and other events from the War in the Pacific. 'Getting over it' doesn't mean forgetting it or that there can be no remembrance or commemoration. As a way of celebrating Australia Day 2018, the Liberal Party in Victoria (currently sitting in opposition), has promised to ditch the cross-curriculum priorities of teaching students about Aboriginal and Torres Strait Islander histories in favour of teaching 'Australian values' and ... wait for it ... the Orwellian-titled 'principles of Western enlightenment'(14). We've seen the Australian values that the extreme right-wing of the Liberal Party embrace: genocide, ethnic cleansing, racial purity, racism, xenophobia. Contrast this with New South Wales, where the Labor Party (also currently in opposition) has promised to sign a Treaty with indigenous people which will likely recognise the historic wrongs of the past(15). Australia Day has become somewhat of a battle-ground between nationalist white Australians who feel indigenous people should just get over it, and those people who see it as Invasion Day, signifying the beginning of colonisation. Of course, there are Aussies who are not at either end of the spectrum, who are just happy to celebrate being Australian. A recent study found that most Australians don't care what day Australia Day is held(16). There are also indigenous people who are not in favour of moving Australia Day, while some are. However, most indigenous people, whether they want to move Australia Day or not, are in agreement on the need for acknowledgement and recognition of the atrocities their people have suffered, and continue to suffer. It is this lack of recognition that is one of the most hurtful issues. Sadly, people swallowed this article and shared it across social media, as though it completely shot down any claim of Australia's genocidal past. It is pure ignorance and empowers far too many people to continue the lack of recognition or understanding of indigenous issues and Australian history. The Australia Day holiday hasn't always been held on 26 January. Other dates included 24 May, which was introduced in 1905 as Empire Day and happened to be Queen Victoria's birthday. 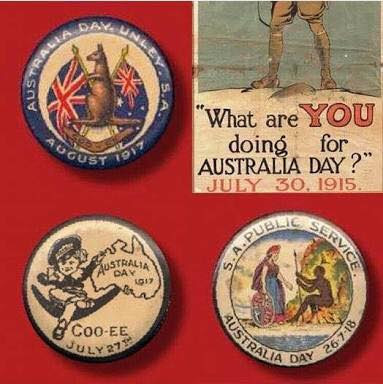 In 1915, Australia Day was held on 30 July. The Australian Natives Association lobbied for years for Australia Day to be held on 26 January. Don't get too excited about the name of this association, it was not an association of indigenous people. It was an association of white men with the aim to provide medical, sickness and funeral benefits to people born in Australia of European descent. The Association lobbied for federation, which was achieved in 1901. In the 1930s, it lobbied for 26 January being recognised as Australia Day. In 1935, this was achieved when all states agreed on the date(19). It wasn't until the 1940s that Australia Day was formalised as a national holiday. However, prior to 1994, the holiday was usually held on the nearest Monday to 26 January so that Australians could enjoy a long weekend. 26 January has been a day of controversy for indigenous Australians, a day that marks the invasion of their land, displacement, disadvantage, inequality and ongoing racism. Protests against 26 January are not new. On 26 January 1938, the 150th anniversary of the arrival of the First Fleet, indigenous leaders met in Sydney for a Day of Mourning to protest the displacement and abuse that they had suffered since 1788(20). Meanwhile, the government showed how inclusive 1938's Australia Day was by forcing 25 aborigines from Menindee Mission in far west NSW to perform in a re-enactment of the First Fleet. They were to play the part of retreating aborigines and were told that their families would starve if they didn't do it(21). The attitude of two former Prime Ministers, Tony Abbott and John Howard, shows that Australia has a long way to go in overcoming centuries of racism. Both of these men, by the way, claim to be Christians, defending Christian values. Apparently, ignoring genocide and institutionalised racism fits well with their version of Christianity. Telling indigenous people to 'move on' because this 'happened 200 years ago', clearly shows that the same attitudes of 200 years ago still prevail in sections of the white community. Perhaps it is they who need to move on from their racist and ignorant views and accept that it is their very attitudes and approach to indigenous issues that are perpetuating the disadvantage and inequality First Nations People experience to this day. Australia Day has been subject to a white-washing of history. It is not a 'black arm-band' view of history to tell the truth about what happened and is still happening to this day. It is about recognition and honesty. Move Australia Day to a day that is not linked to the bloodshed and dispossession of indigenous people. Chose a day that is less divisive and doesn't represent the invasion of this land. While some indigenous people want it to stay on 26 January, two quotes by indigenous people stand out explaining why it should be moved. Karen Mundine, chief executive of Reconciliation Australia, stated, 'Asking Indigenous people to celebrate on January 26 is like asking them to dance on their ancestors' graves'. Of course, another solution could be to have a day of recognition for indigenous Australia. The Australian Capital Territory has announced that 28 May 2018 will be the first Reconciliation Day public holiday(24). Each year the holiday will be held on the Monday on or immediately after 27 May, which is the anniversary of the 1967 referendum in which Australians voted to amend the Constitution to allow indigenous people to be counted in the census and to access better services(25). Whether Australia Day is moved or not, and certainly while it remains on 26 January, we must stop ignoring the issues past and present. As a start, at least acknowledge and recognise these matters which still affect indigenous people to this day. This isn't about wallowing in the past, it is about remembrance ... and isn't the only day of remembrance held. Consider that the indigenous population of Australia in 1788 was more than 777,000, by 1900 had fallen by 85% to around 117,000(26). More than 650,000 were killed by military action, murders by settlers, and disease. Imagine if Australia of today, with a population of 24 million, was invaded for a foreign force and close to decimated, it would see more than 20 million people dead. Surely there would be a day of remembrance! Why should this be any different for the First Nations People? By today's definition, it was genocide. While the term didn't exist until the 20th century, the definition of genocide under the United Nations Convention on the Prevention and Punishment of the Crime of Genocide, which applies in both times of peace and times of war, is (a) killing members of the group, (b) causing serious bodily or mental harm to members of the group, (c) deliberately inflicting on the group conditions of life calculated to bring about its physical destruction in whole or in part, (d) imposing measures intended to prevent births within the group, (e) forcibly transferring children of the group to another group(27). 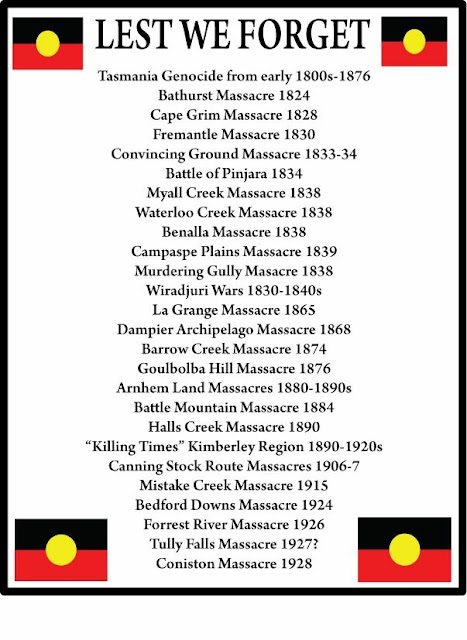 Each of these actions were undertaken against the First Nations People, whether it be by the violent actions of the military and settlers, government policies that dehumanised indigenous people, the eugenics discussed above, the slave-like conditions they were forced into, the stolen wages, and of course the Stolen Generations. No other people group would be expected to forget this or told to just 'get over it'. 'Getting over it' doesn't mean forgetting it or that there can be no remembrance or commemoration. Telling indigenous people that these things belong in the past is to ignore the fact, that those actions of the past are still felt to this day. For instance, almost every Aboriginal community that the government is fond of criticising, was created by the government as it relocated different Aboriginal and Torres Strait islander tribes to common areas, which they then also used for shipping Pacific Islanders to (remember the slave-trading black-birding? Another shameful moment in Australian history). Campaigns to change the date are not new. Indigenous people have been protesting against 26 January since at least 1938. So this isn't the result of the modern phenomenon of 'political correctness gone mad', that some people like to use as some sort of ubiquitous boogey-man to hide their racism and ignorance behind. Why forget the sacrifices of indigenous people of the past? Why forget about the racist behaviours and policies that empowered the abuse of indigenous people? As Italian philosopher, George Santayana wrote, 'Those who cannot remember the past are doomed to repeat it'. The anger by many Australians about the calls for a change of date, and even just to remember indigenous history, vividly demonstrates why it is imperative that we do not gloss over or forget the past abuses and the present issues faced by indigenous people. No-one is being held accountable for the massacres of the 19th century, however, we are all accountable for the institutionalised racism and ignorant, racist views of people today, some of whom are political leaders who have their heads in the sand about indigenous history and current affairs. Only then, can we begin to address the underlying causes of social issues and disadvantage that challenge much of indigenous Australia today. 2. Reynolds, H. 2000, Chapter X - Confronting the Myth of Peaceful Settlement, Why Weren't We Told?, Penguin. 3. University of Newcastle, The Centre for 21st Century Humanities, Colonial Frontier Massacres in Eastern Australia 1788 - 1872, https://c21ch.newcastle.edu.au/colonialmassacres. Accessed 24 January 2018. 4. National Museum of Australia, First Australians, Coniston Massacre, http://www.nma.gov.au/exhibitions/first_australians/resistance/coniston_massacre. Accessed 24 January 2018. 5. The Guardian, Helen Davidson, John Howard: there was no genocide against Indigenous Australians, 22 September 2014, https://www.theguardian.com/world/2014/sep/22/john-howard-there-was-no-genocide-against-indigenous-australians. Accessed 24 January 2018. 6. SBS, NITV, Nakari Thorpe, 'He's an idiot': Abbott's First Fleet 'good' for Aboriginal people comment met with outrage, 22 January 2018, https://www.sbs.com.au/nitv/nitv-news/article/2018/01/22/hes-idiot-abbotts-first-fleet-good-aboriginal-people-comment-met-outrage. Accessed 24 January 2018. 7. ABC, Anna Henderson, Prime Minister Tony Abbott describes Sydney as 'nothing but bush' before First Fleet arrived in 1788, 14 November 2014, http://www.abc.net.au/news/2014-11-14/abbot-describes-1778-australia-as-nothing-but-bush/5892608. Accessed 24 January 2018. 8. The Guardian, Calla Wahlquist and Paul Karp, What our leaders say about Australia Day - and where did it start, anyway?, 19 January 2018, https://www.theguardian.com/australia-news/2018/jan/19/what-our-leaders-say-about-australia-day-and-where-did-it-start-anyway. Accessed 25 January 2018. 9. Museums Victoria Collections, Item HT 24038, Book - AO Neville, 'Australia's Coloured Minority: Its Place in the Community', Currawong Publishing Co, 1947, https://collections.museumvictoria.com.au/items/1496210. Accessed 24 January 2018. 10. Eugenics Archives, The Stolen Generations, http://eugenicsarchive.ca/discover/connections/53d8321a4c879d0000000012. Accessed 24 January 2018. 11. Australasian Legal Information Institute, Murdoch University Electronic Journal of Law, Unfinished Business: The Australian Stolen Generations, http://www.austlii.edu.au/au/journals/MurUEJL/2000/45.html. Accessed 24 January 2018. 12. Rosalind Kidd, 2000. Black Lives, Government Lies, UNSW Press. 13. Creative Spirits, www.CreativeSpirits.info, Aboriginal culture - Economy - Stolen Wages Timeline, https://www.creativespirits.info/aboriginalculture/economy/stolen-wages-timeline. Accessed 24 January 2018. 14. SBS News, Source: AAP, Victorian Liberals vow to teach students 'Australian values', 24 January 2018, https://www.sbs.com.au/news/victorian-liberals-vow-to-teach-students-australian-values. Accessed 24 January 2018. 15. The Guardian, Calla Wahlquist, NSW Labor plans to sign treaty recognising Indigenous ownership, 25 January 2018, https://www.theguardian.com/australia-news/2018/jan/25/nsw-labor-plans-to-sign-treaty-recognising-indigenous-ownership. Accessed 25 January 2018. 16. The Sydney Morning Herald, Adam Gartrell, Most don't care when Australia Day is held, poll finds, 18 January 2018, http://www.smh.com.au/federal-politics/political-news/most-dont-care-when-australia-day-is-held-poll-finds-20180116-h0j0w9.html. Accessed 24 January 2018. 17. WA Today, Sherry Sufi, Inconvenient fact: Native title can only exist if Australia was settled, not invaded, 20 January 2018, http://www.watoday.com.au/wa-news/inconvenient-fact-native-title-can-only-exist-if-australia-was-settled-not-invaded-20180119-h0l9hb.html. Accessed 24 January 2018.
http://hrlibrary.umn.edu/instree/GAres3314.html. Accessed 25 January 2018. 19. National Australia Day Council Ltd, About Australia Day, History, https://www.australiaday.org.au/about-australia-day/history/. Accessed 25 January 2018. 20. The Conversation, Kate Darian-Smith, Australia Day, Invasion Day, Survival Day: a long history of celebration and contestation, 26 January 2017, https://theconversation.com/australia-day-invasion-day-survival-day-a-long-history-of-celebration-and-contestation-70278. Accessed 24 January 2018. 21. ABC News, Aimee Volkofsky, 'We thought we were going to be massacred': 80 years since forced First Fleet re-enactment, 25 January 2018, http://www.abc.net.au/news/2018-01-25/eighty-years-since-forced-first-fleet-reenactment/9358854. Accessed 25 January 2018. 22. News.com.au, Charis Chang, Debunking the myth of Australia Day, 29 August 2017, http://www.news.com.au/national/debunking-the-myth-of-australia-day/news-story/e8bea4ede13fabb9f303b75dcdc50a69. Accessed 25 January 2017. 23. ABC News , Bridget Brennan, Indigenous leaders enraged as advisory board referendum rejected by Malcolm Turnbull, 27 October 2017, http://www.abc.net.au/news/2017-10-27/indigenous-leaders-enraged-by-pms-referendum-rejection/9090762. Accessed 25 January 2018. 24. ACT Government, Open Government, Reconciliation Day Public Holiday an Australian first, 14 September 2017, https://www.cmtedd.act.gov.au/open_government/inform/act_government_media_releases/rachel-stephen-smith-mla-media-releases/2017/reconciliation-day-public-holiday-an-australian-first1. Accessed 25 January 2018. 25. State Library of Victoria, Ergo, The 1967 Referendum, http://ergo.slv.vic.gov.au/explore-history/fight-rights/indigenous-rights/1967-referendum. Accessed 25 January 2018. 26. Creative Spirits, CreativeSpirits.info, Aboriginal population in Australia, https://www.creativespirits.info/aboriginalculture/people/aboriginal-population-in-australia. Accessed 25 January 2018. 27. United Nations Office on Genocide Prevention and the Responsibility to Protect, Genocide, http://www.un.org/en/genocideprevention/genocide.html. Accessed 26 January 2018.